Collectors with limited budgets may have to decide on buying just one of the two 2013-W American Buffalo Gold Coins that will be released by the United States Mint this year. This article provides coin images for the two versions to offer comparisons that may help in making a buying decision. 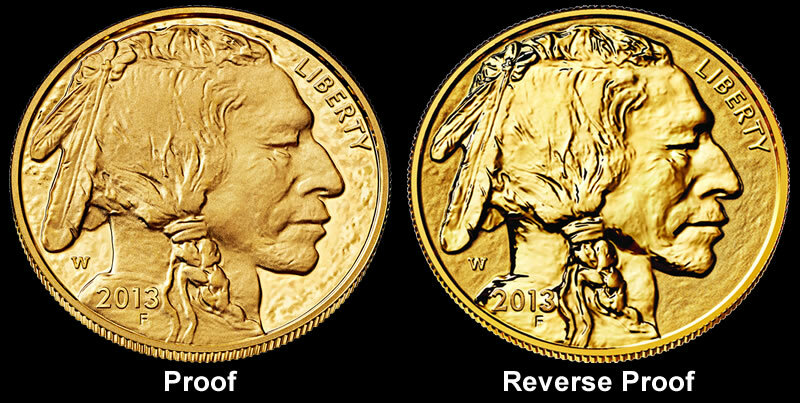 On Thursday, May 23, 2013, the U.S. Mint will release its standard, annually issued 2013-W Proof American Buffalo Gold Coin. At a future yet-to-be announced date, the U.S. Mint will also release a special 2013-W Reverse Proof American Buffalo Gold Coin to celebrate the 100th anniversary of the design appearing on both coins. Never before has the Mint released this type of Buffalo coin. Just to be clear, the standard version that has been issued annually since 2006 is a proof. The commemorative version for the centennial is a reverse proof. "Reversing the mirror-like background finish of a traditional proof coin and applying it to the design elements of the coin achieves a magnificent contrast," the United States Mint website describes. Found on American Buffalo Gold Coins is the heads and tails designs as first created by James Earle Fraser for the original 1913 Type I Buffalo nickel. 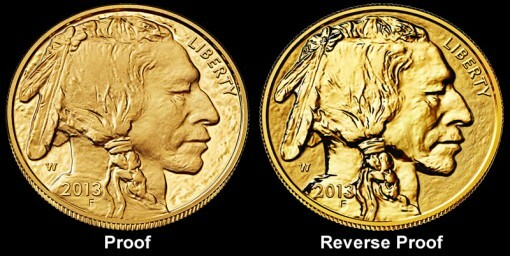 This includes a heads with a profile of a Native American and a reverse with the image of an American Buffalo. 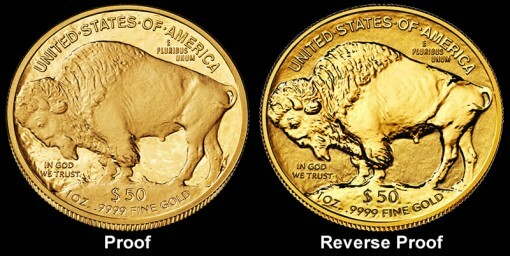 Since their original release, all Buffalo gold coins have been composed from 24-karat, or 99.99% pure, gold. Because of their gold content, prices for the coins can change weekly. The standard annual proof will launch on the 23rd with a starting price of $1,790. The U.S. Mint has said it will use the same pricing method for when the reverse proof is released. While the totals can change, collectors are looking at a sizable, roughly $3,600 amount to own both coins. That is why some may stick to buying only one of them. This will provide a challenge to purchase one (much less both) even with an above average budget. What makes this an even tougher choice this year is with falling Gold prices. The price drop will make this year’s purchase more affordable. However, this in turn will cause a drop in the resale price of gold coins (over the next two years) as the economy improves. One may be stuck with a loss if you are forced to sell your coins within a declining market (price) for physical Gold. Yeah, even one is too rich for my blood. I’ll be looking at eBay later on to see if I can get one cheaper in another couple years. Since the reverse proof will be minted to collector demand I don’t expect this coin to have a low mintage. No matter what, I’m going to get both, First of all, if you collect the reverse proofs, you have to have this one. If you collect Gold Buffalos you must have this one. So, you got to have them. Wow, there goes the budget. Joe#2, bought some first spouse coins that had red spots. My understanding is that these are “rose spots” where silver alloy was not completely mixed and my guess is that the silver makes the spot less yellow, or oxidizes or somehow becomes discolored. Why there should be silver in a .999 gold coin eludes me. It does not pay to keep them in the box for possible first strike grading, you really need to open the shipping box and check them out. Send them back if you find spots. Kahoola, I understand. The problem is this problem happens down the road. The only gold i haven’t seen any problems is,Is with the Perth mint. The U.S. Mint and the Canadian mint as well as the gold Pandas i have seen issues with. If you’re familiar with the Canadian wildlife series that they had, They had issues with milk spots.I guess it’s just a crap shoot if you’ll have issues with the gold buffalos or not. I was anxious to pick these up but why spend a fortune to possibly have issues down the line and the mint won’t stand behind it. My opinion. Folks, I just would like you to check this out and let me know your thoughts. I know some people where these spots wouldn’t bother them at all, And some people that would bother them a lot, Like me. I thought before you spend big money on these, You should be aware of what could happen. go to this link below. @thePhelps, I don’t. I’m just not going to eat, wash or shop for a year. I just called the U.S. Mint , ( spoke to a supervisor )and they told me if your buffalo ( after the 30 days ) should have those red or black spots,they will do nothing about it. Just wanted to let the folks know the ones that are buying it to be aware. Usually these problems do happen down the road. correction… It should say after 7 DAYS, Not 30 like it use to be.. Sent in two identical first spouses to NGC. One had a rose spot. The rose spot spouse came back at MS69. The no spot one came back MS70. It can make a difference in grades apparently. I agree with Victor, I want them both. Have to keep the collection going and the herd growing. I just ordered the Proof. It’s in stock, so it should be here in a couple of days. I’ll let you know how nice it is. As far as i’m concerned to have proof coins graded makes no sense to me. If a gorgeous coin comes straight from a reputable mint, that should be good enough. Maybe it’s “old school” But the good ol hobby or collecting of coins in my opinion is not fun anymore. Everything is to fancy and dang expensive. To have a coin graded for authenticity in some cases is fine. The first strike and early release “thing” to me, is BS. Joe#2 – they’re constructs made up by the graders to drum up business. There’s no way to tell when a coin was minted, especially when they make and ship so many of them so soon after issue date. The mint probably goes through thousands of dies when minting a particular coin. Where does first strike fit in then? Early release means date of arrival (to me) so has no relevance to the condition of the coin(s) involved – they’re just as perfect as any of the other coins. And yet suckers buy into this rating game and label color, etc. like it actually means something. Nobody’s convinced me (or even tried) that it does yet. Jim, You’re 100% correct. I’m glad someone else sees it my way. I agree with you as well. What is so sad is that this tricky is allowed to continue. Last year, NGC came out with a “special” 25th anniversary black holder. They were touting a $10 fee to re-slab from the old holders to the new ones. I posted a comment, “Who cares.” They responded, “We do.” Well, there you go, never mind the initial fee, just pay the postage, insurance and another $10 and you too can waste even more money. I do own graded coins. However, I buy them already graded. No way am I going to waste my money, relying on a grade I know should be a 70 and have it come back, anything, but. The 5oz coins will never be graded. I like them, in their capsules, straight from the Mint. I received a letter from the Mint last year on the Spouse coins. They were having production problems, especially with the uncirculated coins. It was an apology letter but their only offered solution was to stop production. With mintages as low as the Spouse coins have they do not want to spend the time/money to fix the issues with contaminated dies. It only went well for those that got Coins before the Mint ceased production. unreal.. Here i wanted to purchase the reg 1 ounce buffalo and the reverse proof coming out, And i’m not because the chance of spotting and whatever, And our own U.S. Mint wont stand behind it past 7 days, When these problems most likely happen down the road..
Shutting down production was a decision made for Dep Dir (Mr Incompetent) Peterson who is loathe to communicate to his superiors or the public his ineptness at running the US Mint – and – hides his head in the sand hoping his problems will go away. In this case they didn’t and finally he (or probably somebody else) was forced to take the drastic action to get the mint back on track. It’s been 8 months since a nomination has been made for a new mint director and yet Congress continues to sit on it’s collective thumbs. Blame Congress or Obama or whoever, we continue to be stuck with Mr Incompetent Peterson. I see the Canadian Mint as more of a boutique kind of mint as far as the collectables go anyway. Didn’t stop me from collecting the 18K gold hologram zodiac series though. I do business with MCM, and except for the 2011 5 coin Silver Eagle set, in Pf-70 and MS-70, for which I “pre ordered” for $2,995, I’ve always gotten a good deal. Hell, no one really knew what they were going to sell for, so I took a shot. Two weeks later, they were selling for $1,400 for the 70’s. But, I still have 5 sets, Un Opened direct from the mint. Maybe I’ll be able to make a buck or three, some day. Others that I use, was APMEX, no longer because they collect tax on money! They lost my business. I like Gainesville, Gold2Keep, Mint Products, First Modern Coins, and some others on EBay. I get notices in e-mail when my favorite sellers have something I need or want and the price is always, the best. And, no shipping and no tax.